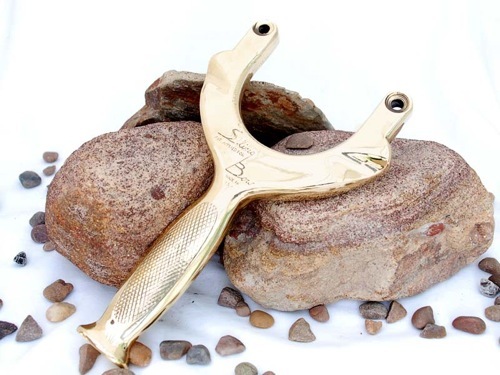 One of the most exciting trends in slingshots are the small manufacturers that appeared during the last few years. There was a time some decades ago when every outdoor magazine sported advertisements of small basement companies selling their own, self-invented, slingshots by mail-order. The introduction of modern mass-produced metal-and-plastic slingshots put the small companies out of business, and the market was (and is) dominated by a relatively small number of big manufacturers. But now, they are back. The internet gives them the advantage of showing their products without much advertisement costs, and slingshot forums help to spread the word. Plus, many slingshot afficionados are longing for a slingshot of special shape or design - and the big companies have yet failed to introduce a small finger-supported "pocket shooter"-model that's starting to become more and more popular. The makers are sorted after the country they live in - mind you, shipping costs can be substantial! Some are true custom makers who make every single slingshot as specified by the customers, others have small lines of slingshots and accessories - though I guess all of them are responsive for individual wishes. 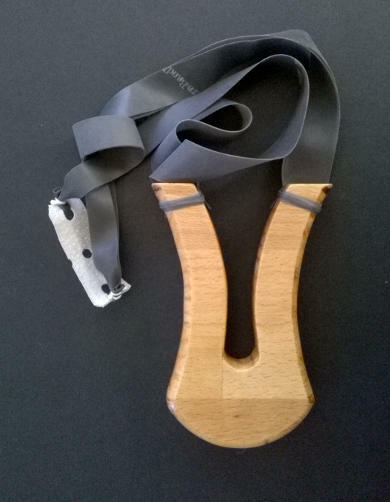 The Italian custom maker "slingshotnew" sells natural and board-cut slingshots. His speciality are the "lyra" models, which have the shape of a long swept "U" and are specially made to be shot in an Albatros / Butterfly shooting style. The guy from "Zwistel.de" make two types of Multiplex slingshots. They also sell wooden ammo and are open to true custom-made slingshots according to your wishes. 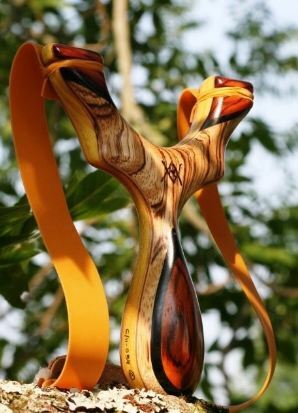 Edelholz-Schleuder.de sells beautifully crafted slingshots made from rare & exotic woods. 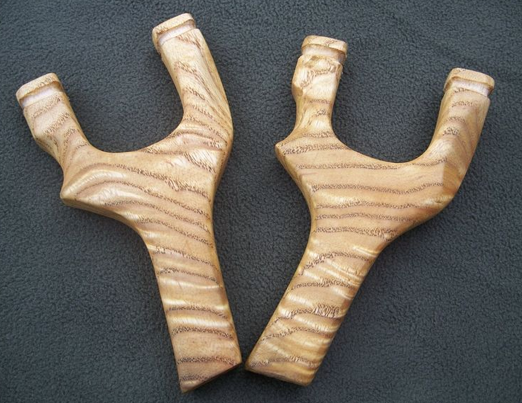 The slingshots are made one piece a time, giving each a unique appearance. Wingshooter is a veteran slingshooter, and uses his expertise to craft very well thought out "Starship" type slingshots with extended fork and wristbrace. He also makes a slingshot that is tailored to shooting arrows. 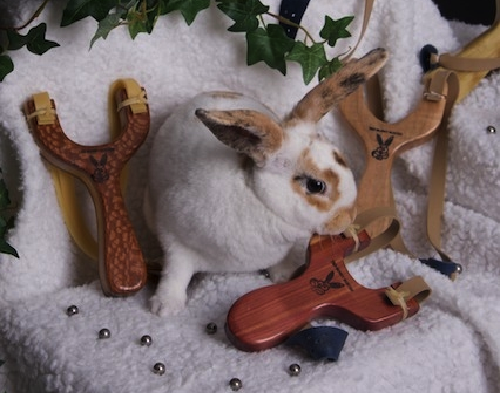 Bunny buster offers a wide variety of wooden and some metal slingshots, plus bands and ammunition. His most popular models are the small "pocket shooters", available in many different kinds of wood. He's holding an on-line tournament every month. You need some bands for your vintage Shooter? Miss the innertube of the old days? Flatband is the guy to talk to. He makes all kinds of flatbands, ranging from latex to different kinds of gum rubber. His bands fit many of the old slingshots (Wham-O, Tinker, Scopeshot etc. 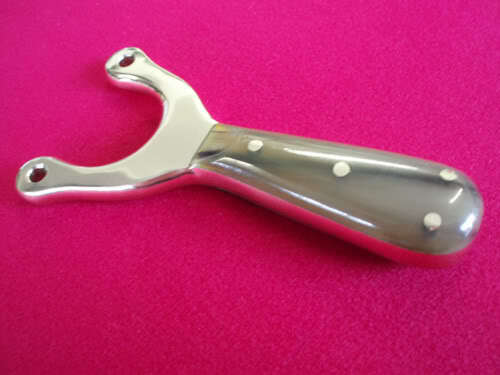 ), as well as modern slingshots that use flatbands. Have a look at his photo album. His "Ergo" slingshots are made of a wide variety of wood, and have a good reputation in slingshot community. 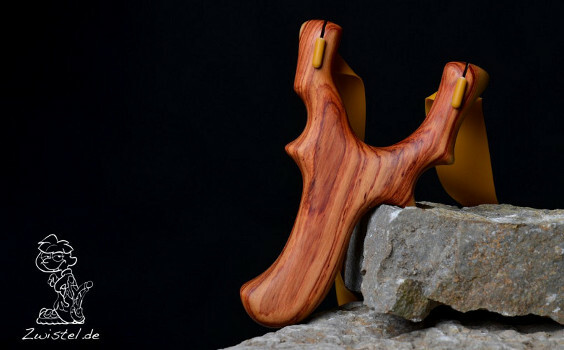 Flippinout makes stunningly nice slingshots, both real custom models according to the buyer's wishes and own creations. 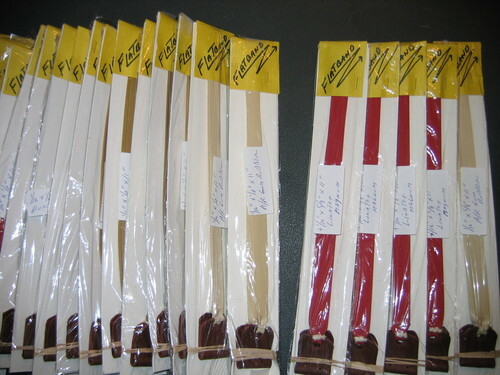 Tex-shooter sells high-quality flat tapered latex bandsets. They fit well in the Saunders flatband slingshots, and have a very high performance. He also sells foam grips that fit the handles of many commercial slingshots such as the Trumatk S9 series of the Saunders Hawk. Jack Koehler is the author of the excellent book "slingshot shooting" and sells the "King Cat", a highly refined tournament slingshot. Catapult Kid is a true custom maker, making every slingshot on order. He makes slingshots from tree forks and board-cuts in various shapes. He also sells tapered latex flatbands with wetmoulded leather pouches. A+ Slingshots makes wooden board-cut slingshots with a unique shape, crafted from a variety of woods and made in three different fork widths. A+ Slingshots also sells flatbands, ammunition and some accessoires such as ammo pouches and magentic lanyards for handling steel balls. 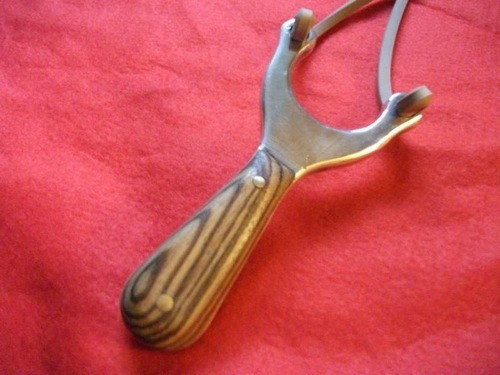 Bells of Hythe sell exclusive metal slingshots, patterned after the vintage Milbro. They also sell cubic rubber, pouches and ammunition molds. Brown's catapults sells Milbro-style metal catapults with handles of different rare woods. Blanks for making Milbros by yourself and rubber is also sold. This is a special slilngshot manufacturer! Hogan in an expert in green sand casting. He can reproduce about any object - not just slingshots - in brass or aluminum. Hogan carries, among several new designs, many of the great vintage slingshots such as the Boler, Tinker Killdeer, Scopeshot, Weber slingbow, Milligan Special, Milbro...even the old ZipZip from 1918 is there. So if you want to experience the style of shooting one of these oldtimers, or have a wooden / plastic slingshot and would like metal duplicates from it, Hogan is the man to talk to. 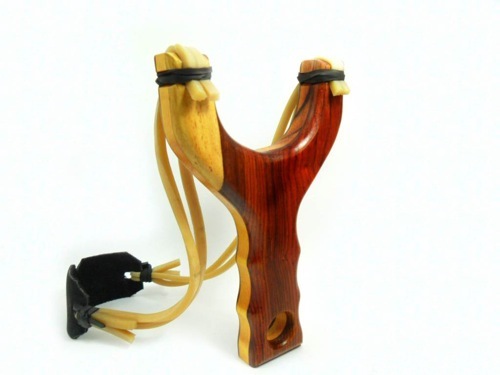 The asturian slingshot association offers very beautiful Spain-Style slingshots, mado of wood and horn. Their semi-flat rubber is known for its good performance and long lifespan. 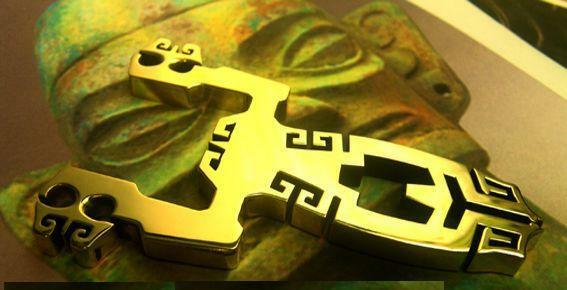 This slingshot maker from China makes metal slingshots according to the customer's design. Materials are either bent metal rods or EDM wire-cut metal sheetings. 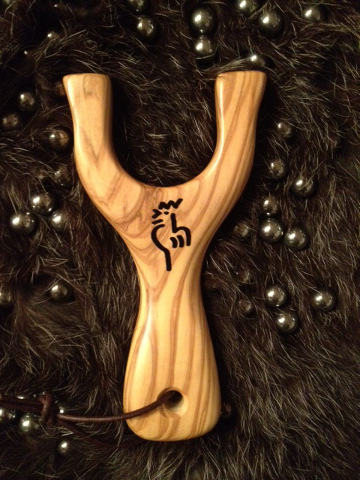 Dankung also sells an extensive range of traditional Chinese slingshots, bands, ammo and rubber. 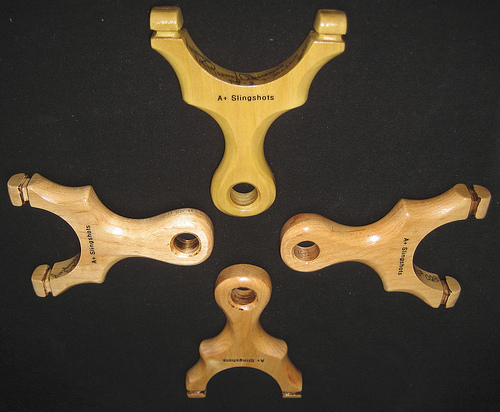 Slingshots.ws sells handcrafted wooden catapults from Nicaragua. 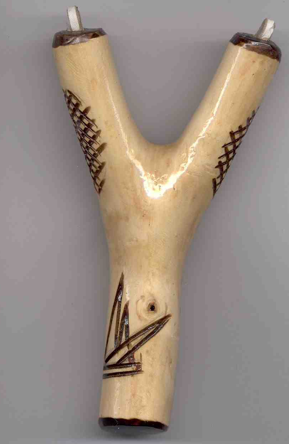 Most of them are made from exotic woods such as Cocobolo or Mora. 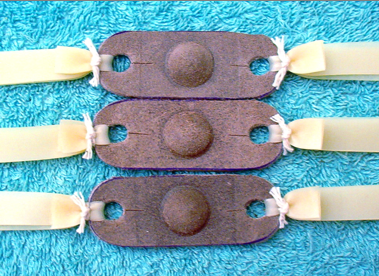 The company also offers solid square rubber that may be interesting for those who want to craft repro bands for some vintage slingshots such as the Milbro.